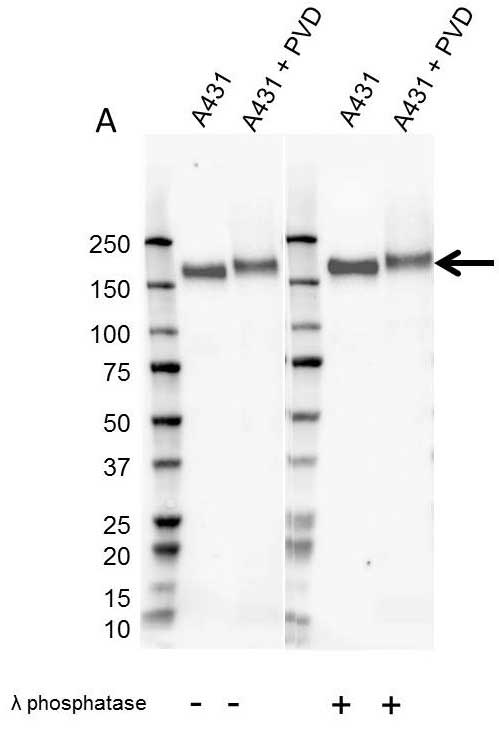 Western Blot analysis of A431 untreated and pervanadate (PVD) whole cell lysates probed with (A) Mouse anti EGF R antibody (VMA00061) followed by detection with HRP conjugated Goat anti Mouse IgG (1/10,000, STAR207P). Membranes were treated with (+) and without (-) lambda protein phosphatase and visualized on the ChemiDoc MP with a (A) 2 second exposure. EGF R has a molecular weight of 175 kDa. EGF receptor antibody recognizes epidermal growth factor receptor, also known as proto-oncogene c-ErbB-1 or receptor tyrosine-protein kinase erbB-1. The antibody has been extensively validated for western blotting using whole cell lysates. Mouse anti Human EGF receptor antibody recognizes the epidermal growth factor receptor, also known as Proto-oncogene c-ErbB-1 or receptor tyrosine-protein kinase erbB-1. The protein encoded by EGFR is a transmembrane glycoprotein that is a member of the protein kinase superfamily. This protein is a receptor for members of the epidermal growth factor family. EGF receptor is a cell surface protein that binds to epidermal growth factor. Binding of the protein to a ligand induces receptor dimerization and tyrosine autophosphorylation and leads to cell proliferation. Mutations in EGFR are associated with lung cancer. Multiple alternatively spliced transcript variants that encode different protein isoforms have been found for EGFR. (provided by RefSeq, Jul 2010). Mouse anti Human EGF receptor antibody detects a band of 170 kDa. 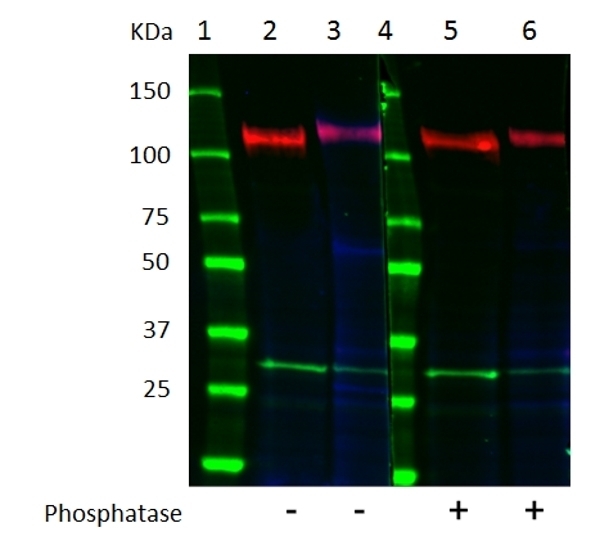 The antibody has been extensively validated for western blotting using whole cell lysates. Anti EGF R detects a band of approximately 170 kDa in A431 cell lysates.